Rubber Room Ramblings: CHRISTMAS COLLAGE HOLIDAY MINI SNEAK PEEK! CHRISTMAS COLLAGE HOLIDAY MINI SNEAK PEEK! Here is another Sneak Peek card made with the Stampin' Up! 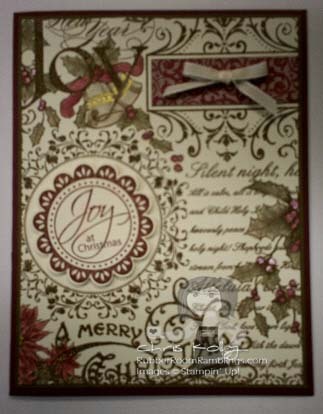 Christmas Collage stamp in the Stampin' Up! Holiday Mini Catalog. This is a card I made with my demonstrator friend and downline, Yvonne Brassat. For this card we used some Bravo Burgundy, Soft Suede and Very Vanilla cardstock. 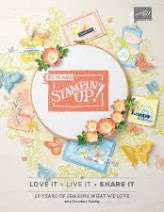 The Designer Series Paper is from the Stampin' Up! Holiday Mini Catalog and is called Deck the Halls. This is a beautiful pack of Designer Series Paper with a very traditional look, and it would make beautiful scrapbook pages. The "Joy at Christmas" stamp is from a Stampin' Up! stamp set called Perfect Punches that is available in the current Idea Book and Catalog on page 131. This is a great stamp set that coordinates with different Stampin' Up! punches and has very versatile sayings/sentiments in it. For accessories we used the 1/8" Taffeta Ribbon in Very Vanilla. This is a great ribbon for making little bows with! We also used some Smooch Pearlized Accent Ink for the center of the berries, flowers and the bells. The Accent Ink gives them a little bit of "sparkle" and makes them look very cool! Remember, it's not too soon to start thinking about those hoilday cards! I will be having my first Holiday Stamp-A-Stack on August 31st from 7:00 - 9:00 p.m. You can make eight great holiday cards (2 each of 4 different designs) for only $12. I supply all the materials, light snacks, coffee, water and fun. All you need to supply is your own adhesive. There are still spots available, but you must sign up before August 24th! 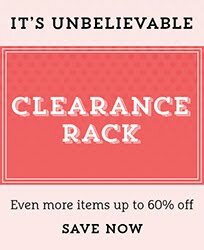 MORE ITEMS AVAILABLE ON THE CLEARANCE RACK! IN A WORD AND TAKE A SIP WHEEL! STAMPIN' UP! BELLS AND BOUGHS SNEAK PEEK! STAMPIN' UP! JUST BELIEVE STAMP SET! STAMPIN' UP! AVIARY STAMP SET! JOLLY OLD SAINT NICK SNOWMAN SNEAK PEAK! STAMPIN' UP! JOLLY OLD SAINT NICK! YVONNE'S BLOG IS UP AND RUNNING! STAMPIN' UP! TWO-STEP OWL PUNCH MEETS MR. FROG! HIP-HIP-HOORAY~~NANCY'S GOT HER BLOG ON! APPLE BLOSSOMS FREE HOSTESS SET FROM STAMPIN' UP! STAMPIN' UP! HOSTESS SET SILHOUETTE SENTIMENTS! LAST CALL FOR STAMPIN' UP! PUNCH RING CLASS! STAMPIN' UP'S! AVIARY MEETS OCCASIONAL QUOTES! 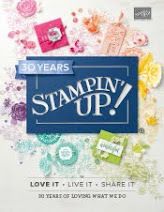 REVITALIZE YOUR STAMPIN' UP! MARKER! MORE STAMPIN' UP! DEMONSTRATOR WORD PLAY! STAMPIN' UP! ELEGANT SOIREE DSP MEETS WORD PLAY! STAMPIN' UP! OWL PUNCH TURNS GHOSTLY! A GIFT FOR MY SISTER! MY STAMPIN' UP! PUNCH RING VIDEO! EVEN MORE STAMPIN' UP! WORD PLAY! MORE STAMPIN' UP! WORD PLAY! STAMPIN' UP! 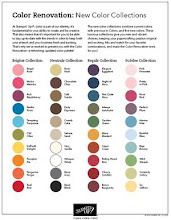 COLOR RENOVATION COLOR KITS UPDATE!